Tremolite is calcium magnesium iron silicate mineral, it’s crystal system is monoclinic. When it crystallises, it forms long bladed crystals which are often twinned. It also occurs in massive and granular habits, as well as fibrous, columnar or plumose aggregates. Its colour is white, grey, pink, green or brown. It sometimes displays transparent crystalline areas. Some of the finest Tremolite crystals are found in Pakistan and Afghanistan. 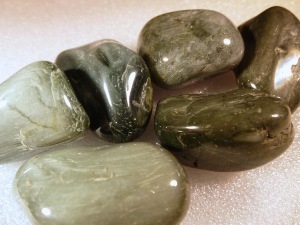 Tremolite is said to help one maintain focus, expand consciousness and remain present during mediation. Said to offer strength and courage to people struggling with a difficult situation, especially those of a nervous disposition. It may ease anxiety or panic wherever it arises and clear emotional baggage, breaking through denial. Tremolite is also said to be useful for children. Placed under the pillow, it may assist children who suffer from nightmares or night terrors.